WILLEMSTAD – The Coast Guard of the Dutch Caribbean, during a routine check on Wednesday, intercepted narcotics on board of a small vessel. The one person on board vessel was arrested immediately. At around 16:45 pm, the Coast Guard Jaguar detected the Venezuelan registered vessel with one person on board and located at the east end of the island. 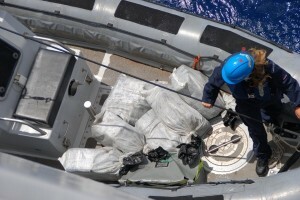 When a control was conducted by the Coast Guard officer, a package was found containing drugs, probably cocaine with a gross weight of 13 kilos. There was also a cargo of rum on board. The vessel, the drugs, the rum and the lone crew were brought to the Coast Guard jetty at Parera and hander over to the Police Corps Curacao (KPC). The Organized Crime Division of the KPC, together with the Coast Guard and Customs, will continue with the investigation.